If you’re thinking of buying a Powertec WB-PR power rack (sometimes called the P-PR), be sure to read my Powertec power rack review before you make a decision. On this page, I’ll discuss my experience in training with my Powertec power rack, including my overall opinion, then list and explain its pros and cons. Note – differences between WB-PR and P-PR: Before 2010, the Powertec power rack models were called P-PR, which is what I own. In 2010, Powertec changed the name of the model series to WB-PR (Workbench Power Rack). The current Powertec power rack model is the WB-PR. However, the new Powertec racks are sometimes called P-PR (even though they’re really the WB-PR) on some websites that sell it, including Amazon (see link to right). By the time you finish reading my review, you should be able to make a better judgement on whether or not a Powertec power rack is right for you. If you’re not familiar with what power racks are, and how they’re used, then you might want to check out power rack training before proceeding with this review. 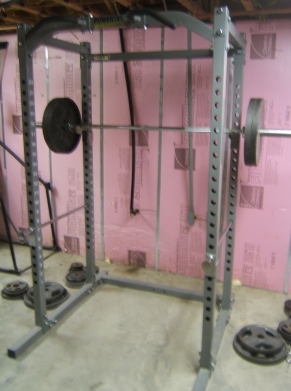 I’ve had this Powertec power rack (see picture below, right) for a little more than 3 years (I bought it in 2008). I have been more than satisfied with my purchase, and can confidently say that I would buy it again if I had to. It allows me to do all the exercises that I need it for, and it keeps me safe while doing them. With the exception of a couple small critiques, everything I have to say is positive about this piece of equipment. Read below for the specifics. Built to last: This rack is solid, made from thick steel and welded together very well. It’s rated at a 1000 lb. capacity. So unless you plan on squatting or bench pressing in the quadruple digits worth of lbs. anytime soon, you can rest assured that this bad-boy can handle any and all abuse you throw at it. Other than the expected scrapes, nicks and dings, mine hasn’t endured any real damage. No bending, cracking, or warping of the metal. Nothing. Best bang for your buck: When I bought my Powertec power rack back in 2008, the price was about $400, if I remember correctly. That’s $250+ less than what it currently goes for. This is likely due to general price inflation and increases in manufacturing costs. However, since all other power rack manufacturers out there experienced similar price increases, the Powertec power rack is still one of the best deals on the market. 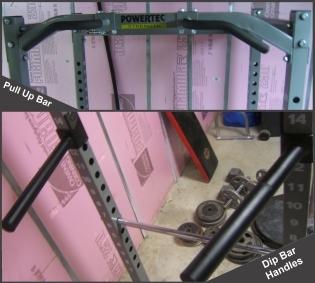 Standard attachements: Dip bars and a pull up bar come standard on this Powertec power rack. I like that the pull up bar provides the ability to do hammer-grip chin ups. That said, I do have a complaint about the pull up bar, which I’ll discuss in the “cons” section. The dip bars are nice, too, because of their versatility. They insert right into the rack slots. So you can move them up or down; put them on the inside or outside; and because of how they’re angled, you can use a closer grip or wider grip. There is, however, a minor issue that occurs for me during dips, which is more of a problem with my floor than with the rack itself. I’ll explain in the “cons” section. Expandability: It’s possible to increase the number and variety of exercises you can do with the Powertec power rack, since you have the option to buy a lat tower/pulley system add-on. I have not personally opted to do this. But just the fact that I can, makes me that much more comfortable with my purchase. I am considering buying this sometime in the future when I have enough spare ca$h stacked. It fits in my basement: This rack is purposefully made to be shorter than a rack you’d find in a typical commercial gym. It is tailored for the average home gym owner, who probably doesn’t have 9 foot ceilings. My basement ceiling is relatively low (~7.5 feet), but the rack makes the clearance with a little room to spare. Easy to move: My basement is pretty crowded with other stuff, and I have to keep all my equipment confined to a spot against the wall when its not in use. That means I have to pull the rack away from the wall before each workout, and push it right back after I’m done. But this isn’t a problem because it’s light enough to slide over my (cement) floor, even with a weighted barbell still on it. Slight wobble during dips & pull ups: When I’m doing dips with any significant amount of weight attached or pull ups, the rack will tremor slightly when I struggle through a sticking point or accelerate quickly. This is not a big issue by any means; more annoying than anything. Plus, it can be fixed since it is mostly due to the fact that my rack is on an uneven cement floor. Being the modern Einstein that I am, I came up with an ingenious workaround solution – I stuff a sock or a rag under the corner that’s not making full contact with floor… And voila, problem solved. Can’t do standing presses: As I mentioned in the “pros” section, this power rack is shorter than commercial ones. While this is a big plus for those with shorter ceilings, it also prevents you from doing standing overhead movements (e.g. barbell overhead press, push press or overhead squats) inside the rack. That said, you can still do these kinds of exercises on the outside the rack. The ability to do the pressing movements inside the rack would come in handy for heavy work, especially partials. The pull up bar is curved: The curved/angled pull up bar makes pull ups feel unnatural. I find it puts may wrists and shoulders in an awkward position. In my opinion, it would be best if Powertec used a straight pull up bar (preferably with hammer/neutral grip handles built in). That said, I can still do pull ups on it, but it’s not ideal. Also, I should mention that some people actually prefer this style of pull up bar, so this may not be a “con” for everyone. There’s also the Rep Fitness PR-5000, which I haven’t reviewed (yet). But it looks amazing and has received very positive feedback since it came out in late 2016. This Powertec power rack is a high quality piece of weight training equipment that won’t break the bank, and will last you years. So if you’re looking for a great power rack for your home gym, and you can deal with its minor shortfalls, then I’d strongly recommend this rack for you, especially if you don’t want to spend an arm and a leg. If you’re interested, you can buy the Powertec power rack here – Note: The rack is no longer called Powertec P-PR. The new model is now called the Powertec WB-PR, or Workbench Power Rack. If you don’t believe this power rack is right for you, then be sure to read my power racking buying guide to figure out which type of rack suits your needs. Then, browse through my power rack comparison chart to sort through 100s of different models to find the perfect one for you. Great article! I’m about to set up my garage gym so I’ve been doing some online research. It seems like the Rogue racks are the way to go, but I’m curious about this Powertec rack. You wrote this article 3 years ago. Now at 2016 would you still recommend this rack, or should I go with a Rogue rack? Hi John, I’m happy that you find my review useful. …So to answer your question, if I were in your shoes, I would most definitely go with Rogue–specifically, I would buy the Rogue R3. The R3 and the Powertec power rack are comparable in terms of dimensions (e.g. an important one I looked at was internal depth, or the front-to-back distance between the vertical uprights, is essentially the same at ~25″ on the Powertec and 24″ on the Rogue R3). The R3 is $50 cheaper, but is better quality in terms of construction–All Rogue racks are made in the USA, while the Powertec power rack (according to my research) is made in China. The R3 has the coveted “Westside hole pattern” (1″ hole spacing in the bench area; 2″ hole spacing everywhere else). Meanwhile, the Powertec has a larger gap of 2.5″ hole spacing all around, which isn’t terrible, but it’s much less precise for when it comes to adjusting the pins and catches during bench bench press. The R3 has a much greater selection of accessories. The concept of the Rogue racks is to be modular. They are built to be expanded upon, so you can always add more accesories in the future to expand the functionality of the rack. That said, the Powertec rack does have a good amount of accessories you can add on. However, it’s not nearly as many, and the rack wasn’t initially designed for that purpose. Let me know what rack you end up going with. I hope you have fun building the rest of your home gym–and even more fun training in it! Whats up Alex! I know this post is a few years old now. I basically inherited the same model Powertec. I need to buy some extra attachments. Do you know which models this is compatible with? I’ve found a lot of information on other cages but not much on powertec? Please help if you can. Hope that helps — enjoy the rack! I got the P-PR-11 model with the original pullup bar for a very good price but I share your concerns about the pullup bar. The more recent version of the bar (WB-PR16-MGBA) seems better but I wanted to hear your opinion whether it would be worth buying or sticking to chin ups on the original would suffice in terms of activation. Any input would be appreciated. Hi Jeff, I just looked up the WB-PR16-MGBA pull up attachment — looks nice…much better than the one that comes with the P-PR-11. For the price, which I see is about $90, I’d say it’s worth the price, especially considering you got a good deal on the rack. HOWEVER, do what you can to confirm that it will actually fit the P-PR-11, since it’s an older rack.